Mesquite Golf Club. Golf Mesquite Palm Springs. Mesquite golf course details and information about Mesquite Golf Club in Palm Springs, California. The Mesquite Golf & Country Club in California is a public, 18 hole, championship golf course. Mesquite golf is in the shadow of the majestic San Jacinto & Santa Rosa mountain range. It has breathtaking views as you wind through 800 swaying palm trees. 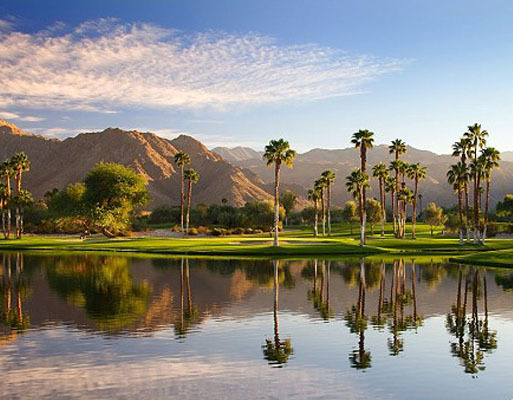 Mequite Palm Springs features tree lined fairways, 5 lakes, and 7 bridges. It is a challenge for players of all skill levels. The Mesquite golf club also has a large grass practice facility and driving range. The Spanish style Clubhouse is 15,000 square feet in size. It has an elevated full restaurant, banquet area, and patio with gorgeous views of the mountains and fairways. Mesquite Country Club also offers a cocktail lounge, pro shop and two racquetball courts. Mesquite Palm Springs has been host to several local PGA & Golden State Tour events. In earlier years, celebrities such as Bob Hope golfed the fairways as well. It is located near downtown Palm Springs, just minutes away from many famous hotels, casinos, and the airport.